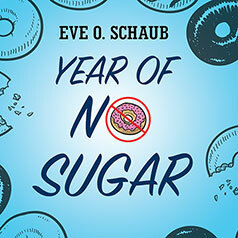 Eve O. Schaub challenged her family to join her on a quest to eat no added sugar for an entire year. Along the way, she uncovered the real costs of our sugar-heavy American diet—including diabetes, obesity, and other health problems. Here is what "kicking the sugar addiction" looks like for a real American family. Where is your sugar coming from? Most likely everywhere. Sure, it's in ice cream and cookies, but what scared Eve O. Schaub was the secret world of sugar—hidden in bacon, crackers, salad dressing, pasta sauce, chicken broth, and baby food. With her eyes open by the work of obesity expert Dr. Robert Lustig and others, Eve challenged her husband and two school-age daughters to join her on a quest to eat no added sugar for an entire year. Along the way, Eve uncovered the real costs of our sugar-heavy American diet—including diabetes, obesity, and increased incidences of health problems such as heart disease and cancer. The stories, tips, and recipes she shares throw fresh light on questionable nutritional advice we've been following for years and show that it is possible to eat at restaurants and go grocery shopping—with less and even no added sugar. You can’t view any supplemental PDF materials before you buy Year of No Sugar. If you purchased it elsewhere, please enter the access code provided in the beginning of the audio to view the supplemental material. All access codes should be entered in lowercase letters. PDF software is required to view the supplemental PDF.